Left: a report page from the first flight across the South Atlantic Ocean in 1922, accepted into the Memory of the World Register in 2011. 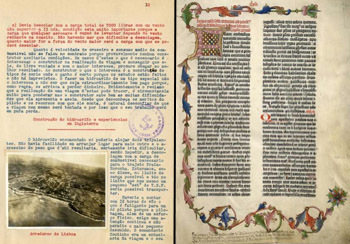 Right: a page of the Gutenberg Bible, accepted into the register in 2001. Oct 13, 2011 • What do the Landsat MSS data archive, the Gutenberg Bible, Tolstoy’s personal library, and the Book of Kells—an eighth century illuminated manuscript created by Celtic monks—have in common? They are all among the 245 international documentary collections that make up the Memory of the World Register. The register is an UNESCO (United Nations Educational, Scientific and Cultural Organization) effort to preserve access to documentary heritage around the world. The Landsat Multispectral Scanner (MSS) data archive of 652,000 images of Earth was nominated to be part of the register in 2010. In 2011, along with six other submissions—including Byzantine manuscripts from Georgia and early reports from the 1922 first flight across the South Atlantic— it was officially accepted into the register. 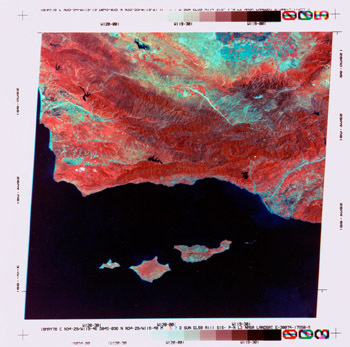 All U.S.-held Landsat data are managed by the U.S. Geological Survey, which maintains original digital files in its primary archives plus back-up copies in off-site locations. The 79-meter spatial resolution and 185 by 185 kilometer area per Landsat “scene” fill an important scientific niche because this Landsat sensor provided global coverage on a seasonal basis, yet its images are detailed enough to characterize human-scale processes such as urban expansion, agricultural irrigation, and deforestation. By establishing baseline knowledge of Earth’s land areas from the early 1970s plus comparative “overlay” images over time, Landsat allows scientists to detect and evaluate environmental change over time. Often, this baseline knowledge is represented in the form of a map. Landsat and cartography have a long history. In July of 1972, Dr. Paul Lowman, a pioneer of the Earth remote sensing concept at NASA’s Goddard Space Flight Center, drew the first map from a Landsat image. Since that time, Landsat derived maps have been used to aid in navigation of poorly charted areas, especially in the Arctic and Antarctic regions where ice conditions can change drastically. Landsat images have been used to map geologic faults and fracture zones. Landsat information has served as the basis for a series of global tectonic activity maps, the first in 1977. Landsat images have also been used to find previously unmapped volcanic fields.